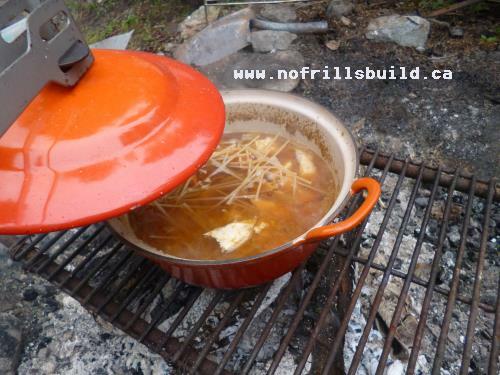 Stoup cooked over an open fire in a Dutch Oven makes even a simple dish taste marvelous; is the smoke from the willow branches? Or just the fact of cooking outdoors? Either way, a Dutch Oven is a great example of cooking simplified. If you've got one of these cast iron pots gathering dust in the basement or garage, it's time to dig it out. 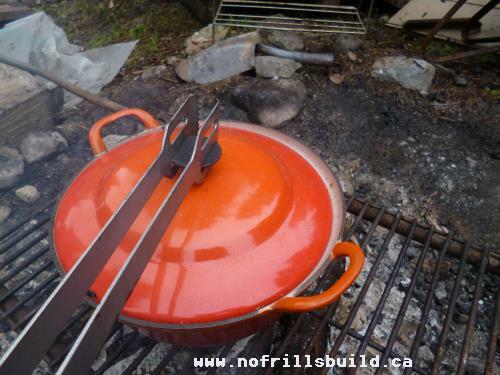 A Dutch Oven is simply a heavy metal pot with a lid; mine happens to be bright orange enamel baked right on. Lots of them are dark metal that just gets better with age. 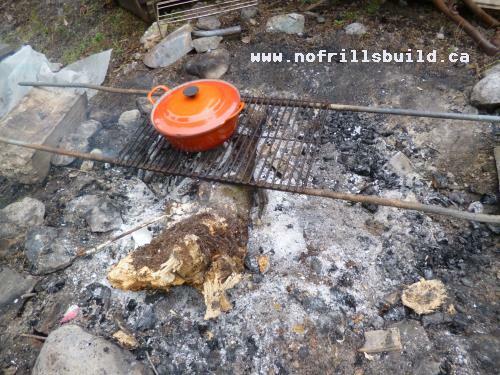 Seasoning, the action of oil in combination with the hot metal, makes the pot resist stains and makes it easier and easier to clean; two things are forbidden; scrubbing the pot with soap, and allowing a dog to lick out the remains of the stew. Either of these will remove the seasoning, and you have to start all over again. 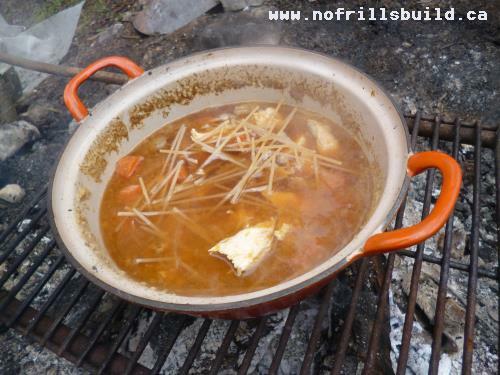 Making stoup, or really thick soup, is easy over a fire; it's important to build up the fire and have some nice coals gleaming in the ashes. Don't allow actual flames to lick the bottom of the pot - it's too hot and builds up too much soot. Some outdoor cooks seal up the lid of the pot with mud, and set it right in the ashes to cook for hours; I usually use the grill that is made from a barbeque grill attached to two ground rods, and to lift the lid and see what's going on and stir the stoup, a set of tongs that just fit the lid perfectly. This stoup is essentially chicken noodle - pieces of chicken breast, sauteed with onion and chopped garlic. Some secret ingredients are added (usually a can of beer, along with some chicken soup base, liquid smoke and a few herbs) and then the lid is put on. It can simmer for up to an hour, and then you can add a handful of noodles - they only need a small amount of cooking, so they won't need to be cooked as long as everything else.